My strategy to come up with a meal when I don’t know what to make (i.e. almost every night) is to think to myself, “ok, pick: grain, vegetable, sauce” and then I normally come up with something decent. For example, soba noodles, broccoli and peanut sauce or quinoa, sweet potato and miso tahini. Anyway, you get the idea. Sometimes though, it is fun to make your own ‘grain’ component. This is probably one of the easiest, most no-fail type of recipes that you can go for. I would also say that it is fast, but there is a little resting time involved. Regardless, there is very little work on your end, especially when you think of alternatives like kneading pasta dough or making gnocchi. 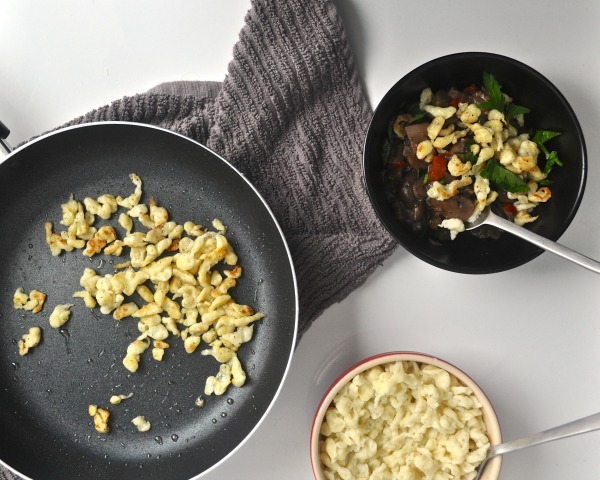 This entry was posted in Main, Side dish and tagged Cheap, dumpling, Easy, food, German, recipe, simple, spaetzle, spatzle on April 3, 2014 by mysecondbreakfast.